I can safely say that my recently retired eventer no longer has to worry about an exercise routine. In the months before the start of the eventing season, I would try and put together an exercise routine for Archie to ensure he was fit enough to compete. Keeping him fit and healthy is always at the top of my priority list. In the winter months, when he was doing less work, Archie found it very easy to gain weight off what seemed like thin air! So, despite not having to be fit for the competition season, I still had to manage his weight. Adjusting his regime and diet accordingly. It can be tricky to keep a horse at their perfect weight. Much of this is due to the many factors you have to consider, such as diet, rugging, change in seasons and the amount of exercise they’re getting. Many studies have linked a number of health issues to horse’s that are over or underweight. So, even if a horse isn’t being ridden for competitive purposes, where they’d need to be very fit, having an exercise regime is a good idea. And for those that can’t be ridden or exercised for whatever reason, there are other ways to manage their weight & health. However, no two horses are the same, so an exercise regime should be tailored to suit each individual horse’s needs. My eventer, needless to say, never had any problem keeping weight on. Due to this his exercise regime, to begin with, would consist of a lot of hacking. Exercise regimes can be planned out over a period of time or be built up to a certain event in mind. For whatever the purpose of the regime, for a horse, it must be built up gradually. This will reduce the risk of injury occurring. Sitting down and planning out an exercise routine, with a good old fashion pen & paper is great but it can limit you somewhat. We’re all pretty connected to our smartphones and there seems to be an app for everything. 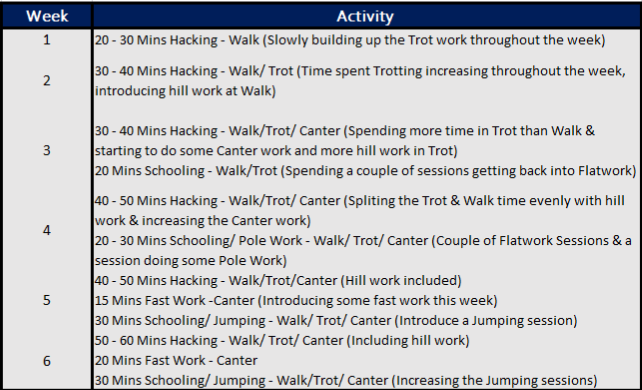 And yes, there are apps out there to help with creating and tracking exercise regimes for your horse. Being able to have your exercise routine on your phone, keeps it at your fingertips whenever you need it. When considering starting an exercise regime, it’s always good to work out the purpose or aim of the regime. Is it for weight loss, improving performance or purely for competitive purposes. For my eventer it’d make sense to design an exercise routine with the purpose of getting him fit for the eventing season. But due to gaining weight on thin air, to start with its aim was just to get him looking less like a beach ball! So, having established the aim of the exercise regime, I use to play around with all sorts of different equine apps. From horse fitness apps to ride analysis apps. To figure out which worked best for what I wanted to achieve. I found that having an app that tracked my rides was a big help. Tracking my rides allowed me to see how long I’d spent on each ride. Some apps also gave me the distance I’d travelled as well. This gave more accurate timing & distance rather than me guessing a rough time spent out riding. Resulting in the horse not getting over or under worked. Many exercise routines will gradually increase such things as gaits. Starting off in walk and slowly introducing more trot as time continues, the same with canter. For this it helps to know how long you spent in each gait. Such apps as Equilab provide you with a breakdown of time spent in each gait. As the app tracks your ride it’ll also track how much time you spend in walk, trot & canter. Having this information available at the end of each ride, allowed me to see how much work my horse was doing. It also logged each activity, so I had a record of all the rides I’d tracked. Allowing me to see Archie’s progression as I steadily increased his work. It can also be used for schooling purposes as it also provides information on how much time was spent on each rein. As mentioned before, much of Archie’s exercise routine, to begin with, will consist of hacking. Apps that track these rides and provide me with information about it are great. But as time progresses his routine changes and such things as flatwork and jumping are introduced. This is when a horse training app is required. I want to be able to see how he’s also performing with a variety of activities during his exercise routine. Equisense is another app with horse performance/fitness in mind. This however requires a wearable device. From the wearable device on your horse, the app can provide you with information about their performance. Analyzing many activities, from show jumping to flatwork. The device also detects the first signs of lameness. Due to the wearable device it can provide a lot more information about the horse’s performance. However, the app also offers features to help with your own & your horse’s performance. The learning feature of the app provides riders with lessons on a variety of activities. The lessons consist of a description and a diagram to help you carry out the exercise. Which is handy when I wanted to do something a little different with Archie. All these apps are providing riders with much more information about the horse’s exercise routine. Making it more accurate and reducing the risk of injury to the horse from over or under working them. The information that equine apps provide us can be very helpful, but don’t solely rely on this information. If you have any queries about your horse’s health or condition contact an equine professional, such as a vet or nutritionist.